Chic Alert: Sleep in a Jar!!! What is it about this night-time miracle worker that has make-up artists and celebrities alike raving? Well, it's the only product that delivers on the promise that it restores the look to skin that's partied into the early hours, making it look like you've had a good night's sleep. Called 'Sleep in a Jar' by its many aficionados – who don't think twice about forking out for the heftily priced elixir – it's packed with rare mineral algae which, and gives a whole new meaning to the words 'beauty sleep'. purifying the epidermis. 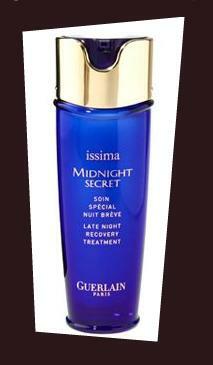 With Guerlain Issima you'll say good morning to soft, healthy-looking skin and a radiant complexion. And today in the Handbag.com Christmas gift competition you have the chance to win the Guerlain Issima Midnight Secret shown here and valued at £53.